I find it difficult to branch out from chocolate when making dessert. It's not that I don't appreciate the endless assortment of dessert varieties available, it's that I am such a chocoholic I'm always worried I will be disappointed. This week, I knew I was going to have branch out. I had a bag of D'Anjou pears on hand that I needed to do something with before they passed their prime. I turned to my trusty library of cookbooks and came across this extremely simple recipe. The most time consuming part is prepping the pears. After you have completed that process, this pie will be finished in no time. Butter a 9" pie dish. 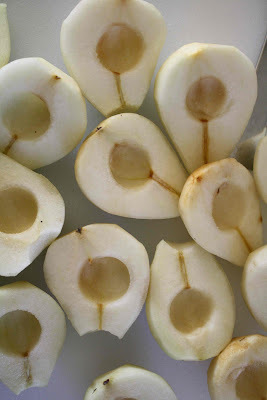 Slice pears thinly and place in the pie dish in an overlapping circle. Pulse remaining ingredients in a blender to create a batter. Pour the batter into the pie dish gently as to not disturb the pear slices. Bake for 45 minutes until golden and firm to the touch. Dust with some powdered sugar if desired and enjoy! This sounds simple and tasty (and not extremely heavy)! Perfect for dinner guests! Oh man this looks good. I love that it is so simple to prepare but looks like you spent hours on it! I loved anything involving baked pears! This actually sounds very simple and elegant. I like how the pears don't have to be cooked beforehand. Whenever I make apple pie, I always cook the apples beforehand, and it makes the waiting all the more difficult :). I am going to buy pears today! This dessert looks fabulous! The nice thing about branching out, is that you can always come back to chocolate ;-) This dessert looks delicious though. i bet chocolate could go with pears :) how about roasted with a chocolate sauce?? this reminds me of a recipe I have and adore for a custardy apple cake. I am a chocoholic too, but fruit desserts like this one are my favorite! I think this just made me change my mind about pears. Yum! Hey, I have tagged you for a meme, the details are on my blog, I hope you come and play! This sounds really good and very, very comforting! Pears are good with custard, although I haven't tasted this combination for years. 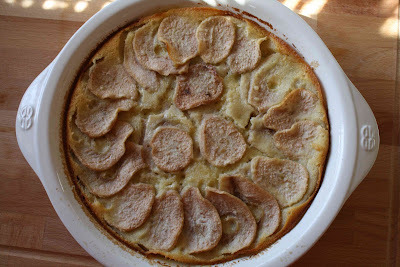 Looks like a great fall version of clafoutis. Mmmmm... clafoutis.